The 18th Guangzhou International Stainless Steel Industry Exhibition will be held between June 28-30, 2017 at the China import and export fair pazhou complex. We will do our best to invite lots of potential industry buyers to visit the event. The exhibition will be the best plateform to stainless steel manufacturers and downstream dealers. Car makers currently import automotive steel from Japan and Korea. Industry experts say steel similar to what these companies import is available locally. Imported sheet metal is required so as to keep light the weight of the vehicle, without compromising on strength of the material utilised. But the technology has been introduced locally by steel producers. Steel producers are on other hand facing tough situation due to high imports and insisting government to impose Bureau of Indian Standards (BIS) cert?cation on import of steel it is being opposed by automotive industry. The auto industry uses its own proprietary technology to certify its vehicles and chooses the appropriate steel for such cert?cation. The Summit will focus on this and many such key issues and will create a platform for automotive and steel industry for making the Make in India a success. 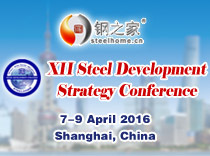 XII Steel Development Strategy Conference will be held in Shanghai, China, on April 7-9, 2016. During our last conference, around 800 delegates from governments, associations, steel mills, miners, traders, research institutes joined us. During SteelHome�s summit, 150 Chinese steel mills and over 300 large-scaled steel traders are waiting here to meet you. SteelHome is glad to be the bridge between you and China, arrange meetings and provide translation services. The conference will be the perfect opportunity for you and your peers to share your views with us and expand your network in the field. CRU is delighted to announce details of its 22nd World Steel Conference on the 16th to 18th March at the Radisson Blu Scandinavia Hotel, Dusseldorf, Germany. This leading iron and steel conference will provide delegates with the latest information on global steel market trends and provide excellent networking opportunities for global steel executives in Europe and the rest of the world. INDIA STEEL � 2nd International Exhibition and Conference is a joint initiative taken by the Ministry of Steel, Government of India and Federation of Indian Chambers of Commerce and Industry (FICCI) to provide a platform to all the Participants, Delegates, Business Visitors and other key decision maker from the Steel and other related industry to interact with, and explore new business avenues. The International Exhibition and Conference "INDIA STEEL "is scheduled to be held at Mumbai, from April 16-18, 2015 at Bombay Exhibition Centre, Mumbai. After the grand success of first and second GCP Summit, Steelgroup.co.in is organising the annual gathering of coated and profiled steel manufacturer, users, processors, technology, equipment and service providers on 10th April 2015 in Delhi. 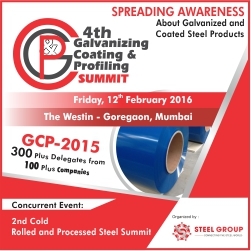 The Annual GCP Summit platform offers unparalleled business network opportunities with large, medium and small players from the Galvanizing, Coating and Profiling sectors under one roof. With the growing market scenario, there is a great need of sharing information and having one to one interaction with key players and decision makers including end users of coated products. GCP Summit is the only business networking forum in India for people and companies to network with key players and understand challenges & opportunity in downstream processing of steel, coating, and profiling areas globally. This unique event also offers exhibition opportunities for products & equipment manufacturer and service providers to display their products and directly meet with prospective buyers and decision makers. At the International Industrial Exhibition Metal-Expo is exhibited the whole range of ferrous and non-ferrous products, as well as the most state-of-the art equipment, contemporary solutions and technologies.This major event including the exhibition and a business forum brought together leading steel producers, tubes and pipes manufacturers, non-ferrous metals processing plants, aluminium rolled products manufacturers, constructors, machine-builders, oil and gas producers and many more. 3 main Metal-Expo expositions including MetallStroyForum (Exhibition for Steel Products and Structures for Construction), MetallurgMash (Exhibition for Equipment and Technologies for Steel Industry and Metalworking), MetallTransLogistik (Exhibition for Transportation and Logistics for Mining and Metallurgical Complex) will cover all the major segments of the steel industry. Over 650 companies from 35 world countries arranged their expositions at Metal-Expo 2014 while more than 30 000 end-users of ferrous and non-ferrous products from various industries including construction, power and engineering complex, transportation and logistics, machine-building etc. visited the event.Metal-Expo 2014 program of events included more than 50 conferences, seminars and round tables covering most of the industry segments. Welcome to participate in Metal-Expo 2015! revolution in the GCC after Oil”. Heavy steel demand due to infrastructure and industrial development fuelled by high oil prices and population requirements. The annual demand for steel products in the GCC region stands at over 40m tonnes, and is expected to grow at 5% to 6% over the next five years. There are over $18bn worth of steel projects at the study, design, tender or execution phase in the GCC, according to MEED ProjectsA total of US$4.3 trillion will be invested in construction projects across the MENA region by 2020GCC will be investing US$50 billion in petrochemical projects. MENA construction sector to see US$ 4.3 trillion investments by 2020, an increase of 80 per cent compared to current figuresNon-oil industrial growth in the region is estimated at 9%, which is driven mainly by the manufacturing sector. The region’s oil and gas industry is planning to invest US$ 666 billion to boost its capacities, as oil prices remain bullishGCC countries are planning to invest US$ 968 billion in major infrastructure projects over the next 10 yearsThe United Arab Emirates has announced a 5% import duty on all Turkish reinforcing bars. Market participants concurred that this could see dormant rolling capacity restarting in the UAE. Succeed to the rich resources and experience of the fourteen exhibitions , it attracts 200,000 professional purchasers. It has been attended by more than 30 countries business departments, and issued by more than 300 media, “The 15th China(Guangzhou)Int’l Metal & Metallurgy Exhibition”will be held at the largest exhibition center in Asia. With the view of the world, experts predict that the largest exhibition in the line will be held in China in the future, hope that we can service satisfied for you by our endeavor. It's our great honor to invite you to be participants of this forthcoming event---Steel Build 2014--a premier platform for structure steel one-stop sourcing, a show to promote environmental-friendly, energy and land saving building made by steel structure, will take place at China Import and Export Fair Pazhou Complex Area B from May 12-14,2014. Your participation in Steel Build 2014 will give you valuable opportunities to show key buyers and decision-makers your new concepts and advanced technologies in steel structural building, and satisfy all visitors who thirst for new solutions from excellent enterprises in the field of steel construction and metal building materials. Metal Bulletin Events Middle East Iron Steel Conference returns for its 17th edition and represents the premier meeting place for steel makers in the region. With over 700 delegates attending from industry leading companies and across the supply chain this uniquely comprehensive networking opportunity is not to be missed. Whilst the region?s burgeoning construction industry is driving demand for steel the challenges of over capacity and threats of imports and dumping still loom large, making attendance at this years? event even more imperative. The vaunted executives panel returns this year and will provide a forum for the leaders of some of the biggest companies in the region to debate the most pressing issues in the market and discuss the future of the steel industry in the MENA region. This event offers an unparalleled opportunity to assess how the steel supply and demand balance will evolve in the region. There will be in depth analysis of the availability of raw materials from iron ore, scrap and DRI to natural gas and energy and comprehensive evaluations of the best steel making technologies available. There will be focus on the finished products and downstream sectors which are driving demand and expert forecasts of future demand. With so much to discuss and so many opportunities emerging in the region the knowledge sharing and networking available at this event is of critical importance. Will excess capacity remain the most significant issue in the steel sector? Where can this overcapacitybe alleviated? What opportunities are there for steel makers to offload inventory? Is China’s current steel production growth rate sustainable? What region will drive steel demand in 2014? These are just some of the questions that “Steel Markets Asia” will seek to answer. Come join Platts on the 14th and 15th of November in Hong Kong to hear from industry experts on the biggest challenges and issues in Asia’s steel markets! · Create awareness on the Government’s planned initiatives, budgets and schemes to expand the base of steel consumption in the economy. In close cooperation with industry leaders, 2013's event will unite Europe’s leading steel supply chain professionals to assess the rationalization taking place in the current climate. Exclusive insight from each element of steel supply chain, highlighting key issues affecting day to day operations and future planning. Meet with your key contacts in the European distribution sector - no other event unites the most influential players in the market! Hear about the markets for steel tubulars in the Eagle Ford, Marcellus, Bakken, Utica, and other major shale plays. Learn about capital investment trends across the different shale plays. Meet senior managers from both the steel and the oil & gas industries. Attendees include the leading steel tubular manufacturers, steel producers, pipeline companies, oil and gas E&P companies, investors, and others. Brandon Blossman, Director, Coal/Power Research, Tudor, Pickering, Holt & Co.
Shale gas - quo vadis? What chemical and petrochemical projects are really on the way in 2013 and 2014? What’s ahead for Nickel, Chrome and Molybdenum? Will Molybdenum by-product supply (from Cu mines) bring prices down further? Stainless steel scrap: Are high discounts the ‘new normal’? The expansion projects of Outokumpu, Allegheny Ludlum, Universal Stainless and Carpenter. With the changed market scenario there is a big challenge in downstream processing of steel, coating, processing and profiling. Market and Customers expectations have increased and the awareness is also at its highest level. To understand market dynamics and network with large, medium and small players in the Galvanizing, Coating and Profiling SteelGroup.co.in is organizing a mega gathering of experts of coated and profiled steel manufacturer & users, processors, technology equipment & service providers and consultant on Friday 22nd February 2013 at Lalit Intercontinental, Mumbai.